Past progressive definition: The past progressive tense is a verb tense that indicates a continuing action or an action in progress that started in the past. 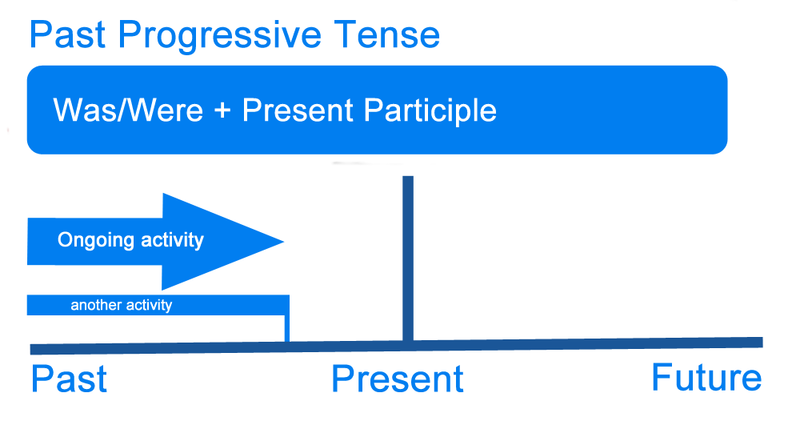 The past progressive tense is a verb tense. The past progressive tense indicates a continuing action or an action in progress that started in the past. The past progressive expresses events that lasted for a duration of time in the past. The past progressive tense is also used in the past perfect progressive. I was riding a bike when I saw the accident. I was working on that paper yesterday. The past progressive tense is formed with a past “to be” verb conjugation and the present participle of a verb (-ing ending). Sentence: You were going to the party. Sentence: I was trying a new recipe. This refers to events that started in the past but were ongoing. That is, they continued for a period of time. This refers to actions that were taking place in the past when another action took place and interrupted them (simple past). My wife was sleeping when I woke her up. They were recalling the event when the alarm sounded. He was finishing his homework when I called. We were ordering when you interrupted. I lost my headphones while I was visiting New York. This refers to events in the past that happened simultaneously. I was lying on the bed while I was reading. You were talking as you were thinking. They were sitting by the fire and recalling the day’s events. We were ordering and you were interrupting. She was reading as I was arriving. This refers to using a particular tone when inquiring. This is used in formal situations. He was wondering if you could assist him. I was wondering if you know where to find the restroom. We were wondering how to get to the train station. Define past progressive: the definition of past progressive is the tense used to describe ongoing activity in the past. 1 What is the Past Progressive?